South Africa goes to the polls on 8 May. Plans to amend the constitution to allow for the expropriation of land without compensation have been a central election issue which is causing much concern among the country's farming community. Limpopo, which used to be known as the Transvaal, lies to the north of Johannesburg and is one of the country’s most productive and resource rich regions. Beef, maize, bananas and citrus fruits are among the many things grown on the land, while coal, diamonds and platinum lie beneath, so it’s no surprise that the issue of land ownership is a major one here. Under the baking early morning sun, Leon Borcahards surveys hundreds of hectares of peanut plants that are sprouting out of the red earth and being sprinkled by a mechanical irrigation system. The President of the local farmers Association - Agri Limpopo- Borcahards runs a farm that has been in his family since the 1960s. He said he's currently holding off on investing in his business and is concerned about the future because of plans to expropriate land without compensation. 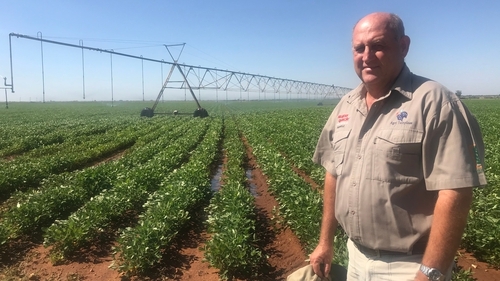 "The ANC has said they will not expropriate productive farms and things like that, what worries us as farmers, is that its gives politicians a tool that is a dangerous tool. "Today I can have the best intentions, tomorrow someone else, he is a politician and he doesn't have the best intentions, so that is what is creating the uncertainty and that's bad for our business". Among the Acacia trees and long grass, Johann Abries’ cattle graze. "Zimbabwe have been through a similar thing which is very well known, which was actually land grabs in a very aggressive way, where farmers were told just overnight you have to be off your land tomorrow morning. "There are Cabinet ministers in Zimbabwe that are telling South Africa, whatever you do, don't follow that route, it's is a recipe for disaster...and we are truly worried that this populist rhetoric that is doing the rounds at the moment that giving land is going to solve all your problems, that the moment you are given land you are going to be a rich man that is certainly not the case". All the farmers I spoke to in Limpopo repeat the same point, that modern farming methods means it’s not something that can be easily take on by somebody without experience. Abries accepts that land ownership rates need to change but says that this can be done in a co-operative way. He said he and others are willing to give part of their farms to black people who are already labouring on their land and to work with them to develop sustainable businesses. "We have to take hands, black and white. Black farmers and white farmers needs to support each other and we need to maintain the food security in this country and the only way to do it is if we work alongside each other, if we take each others’ hands, not to follow these populist recipes that the government is trying to force onto us". Nono Sekhoto is a black farmer and the Chair of the Youth Wing of the African Farmers Association of South Africa. She and her father bought a farm with State support but when the business got into trouble the government had to take ownership of the land. "If you are going to take commercial farms and give them into the hands of new developing farmers it’s around how do you support those farmers to ensure those business as actually productive? "Ownership would be great but it’s not necessary, not for me it’s not. I just need a secure tenure so I can operate a business there". It's not clear if the ANC will follow through on what is seen by some as an election promise but whatever happens next, white farmers say they will challenge any attempts to change the constitution, first through the courts then via international bodies. In 2005, a little over a year after the tragic death of Irish journalist Simon Cumbers, Irish Aid established the Simon Cumbers Media Fund to honour his memory. The aim of the Fund is to assist and promote more and better quality media coverage of development issues in the Irish media.